I bring you warm Fraternal Greetings from Illustrious Sir Daniel Holland, President of the Southeastern Shrine Association. 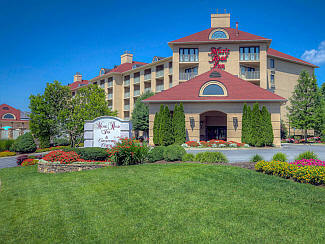 Pigeon Forge has many hotels available to accommodate our Nobility for the convention. If your Temple participates in the annual Kerbela Fun Fest, you may want to use that same hotel for housing. A quick internet search will bring you dozens of hotel options. In the coming years, the S.E.S.A. intends to contract with multiple hotels based on this year�s attendance. Registration Form: Please note that the Registration Fee is only $12 per NOBLE. Ladies are not required to pay a registration fee for 2019. However, if your lady would like to receive a lanyard, identification badge and souvenir program, a $5 registration fee is required. We ask that you make copies of this registration form and distribute them to your Divan and Nobility in order that all are afforded the opportunity to register and attend the annual convention. Schedule of Events: Some Unit Association events are to be announced as we coordinate with the Associations in preparation for the convention. We are also working on Parade details for that Saturday morning. Additional information will be posted on the S.E.S.A. website as it is made available. S.E.S.A. Officer Nominating Procedure: The office of Fifth Vice Presidents of the Association will be open for nominations at the 2019 business meeting and any other office that may become vacant. Souvenir Program Advertising Information: Every year the Association publishes a souvenir program that is complimentary to attendees as a memento of the convention. Please make copies of the contract and encourage your Divan, Clubs, Units and individual Nobles to support the S.E.S.A. by placing an ad or becoming a booster. The ads offset the cost of the publication and support the convention activities. In closing, it is our desire that all member Temples of the Association will plan to attend, participate and enjoy the Annual Convention. We hope that you will promote this opportunity for fun and fellowship within your respective Temples. Many of our Nobility have not experienced an Association Convention and we believe that Pigeon Forge, TN affords a great opportunity for new Nobles to bring their families to fellowship and enjoy the camaraderie that our beloved Shrine Fraternity offers. If you have any questions or concerns, please email me at: shawn@fratline.net. I hope to greet you and your Nobility in August! Thank you for supporting YOUR ASSOCIATION. On behalf of the sales team, staff and management of Music Road Resort we would like to thank you for your upcoming business, and for placing you confidence in us for the conference for The SouthEastern Shrine Association. 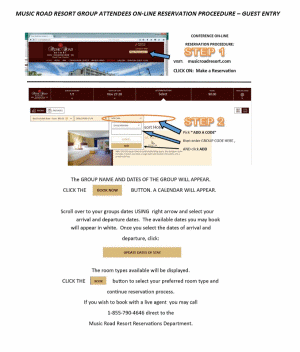 We would like to introduce you to the different methods your group can secure their room reservation. Making reservations for rooms for your event can be accomplished by your individual attendees in three ways. This process does not apply to rooms in your master account, which you will be reserving via a rooming list. Please review your master room needs with your sales representative to set those rooms aside BEFORE you inform attendees that your block is open for reservations. These options are for what we call �Make-Own, Pay-Own� guests. 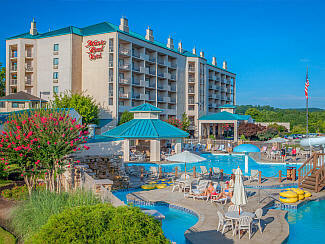 1) They may call direct to our reservations department to speak to an agent for personal service at 1-855-790-4646. If you need assistance in any of these steps, or have questions regarding your on-line rooms block, please do not hesitate to contact us. We look forward to serving you! Click on the image above to get the best offers with all kinds of discounts, coupons, etc. Nobles and Ladies: The President�s Evening will be held at the Grand Majestic Theater. The show is �America�s Hit Parade� and includes a buffet dinner for $50 per person (tax & tip included). The theater is within a short walk of both hotels. Tickets are purchased in advance on the registration form. The Hit Parade show in Pigeon Forge is professionally choreographed singing and dancing showcasing jukebox hits from the �50s and �60s, a selection of later chart toppers, plus a moving tribute to our military with veteran recognition. Enjoy a blast to the past with this highly entertaining show. Hit Parade features some of the top jukebox hits from the early days of rock-n-roll. Rock around the clock with hits from such notable groups and artists as Frankie Valli and the Four Seasons, the Everly Brothers, Neil Diamond, the Righteous Brothers, the Supremes, and Elvis Presley. Then travel with us to more recent times with hits from GREASE, Tina Turner, and others. You�ll be moved by our tribute to all branches of the U.S. military. The Hit Paraded Dinner Show at The Grand Majestic Theater offers �all you can eat� buffet dinner before every show*. The Hit Parade dinner menu includes: Chicken Tenders, Chicken Strips, Meatloaf, Mashed Potatoes, Mac-n-Cheese, Sweet Corn, Green Beans, Fried Okra, a Dinner Roll and an a delicious Brownie for Dessert. Soft drinks include iced tea, water, and Coca-cola products. Coffee is available. The theater also serves your favorite adult beverages including a selection of beer, wine, wine coolers, and moonshine.